This tutorial shows you how to compile the latest version of Wireshark, v1.12.5 as at May 2015, with SSL/TLS support, on CentOS 5.9. This is useful because the last version of Wireshark available on CentOS 5.x repositories is 1.0.15, released in 2010, and later versions are only released for CentOS 6 or 7. You can also use the steps described in this tutorial and compile Wireshark for Redhat 5 or other Linux distributions that come with outdated versions of Wireshark. First I must say that there is a reason why newer versions of Wireshark are not automatically available for CentOS 5. Wireshark 1.6 and above requires GLib 2.16 or newer to compile whereas the last GLib official release for CentOS 5.9 is only 2.14. Unlike many other package requirements of Wireshark (autoconf, automake, flex, etc.) whose later versions can be installed via yum install or compiled from code, GLib is an integral part of CentOS (and most Linux operating systems), and cannot be upgraded without recompiling the kernel using the updated version. This is perhaps why the Wireshark developer team has chosen to only support CentOS 6 and 7 for newer releases. Fortunately there is a way to overcome this limitation, which is to perform a static build of Wireshark that includes all the necessary libraries at compile time and can run on just a base CentOS installation. I came across this method from this post after three long days of research and have chosen to describe the compilation steps in details to help others with similar problems. To demonstrate the whole process as clearly as possible, we will start the build on a virtual machine with just a CentOS 5.9 base installation. You must have autoconf 2.60 or later installed to compile Wireshark. You must have automake 1.9 or later installed to compile Wireshark. You must have libtool 1.4 or later installed to compile Wireshark. Now type "./configure [options]" and "make" to compile Wireshark. configure: error: GLib 2.16.0 or later distribution not found. For young players, GLib is a core component of the OS so you can’t upgrade it via yum. Do not try blindly and execute commands such as yum remove glib or yum remove glib2 in the hope that you can upgrade the library – you will most likely end up with a broken system that needs a fresh install. Same goes for OpenSSL, which we will touch later, do not attempt yum remove openssl, which will remove hundreds of packages and require a reinstall afterwards. The above configuration options tell Wireshark to perform a static build (-fPIC) using the glib static libraries at /tmp/glib/lib (LD_LIBRARY_PATH) with the bundled pkgconfig (PKG_CONFIG_PATH) and output the static binaries to /use/local/myshark (–prefix). Additionally, LDFLAGS allows the linker to link the output with the provided static GLib binaries, otherwise there will be some linker errors during the make process. Kerberos support also needs to be disabled (–with-krb5=no) to avoid missing headers during compilation. I am not sure why this issue does not occur with a normal build. If the result shows Use gnutls library : no, make sure that packages gnutls and gnutls-devel are installed. If error SSL crypto library was requested, but is not available is encountered, check that you have installed openssl-devel package. If Use GNU crypto library is no, install libgcrypt and libgcrypt-devel packages. It works! Now we have a fully functional latest version of Wireshark 1.12.5 running on just CentOS 5. For an idea of what is possible with Wireshark 1.12.5 but not with Wireshark 1.0.15, try to decrypt TLS 1.2 traffic with TLS_RSA_WITH_AES_256_CBC_SHA256 encryption using a self-signed cert. In my test, Wireshark 1.0.15 would not even even recognize the SSL handshake while the latest version could decrypt the traffic just fine. It seems as if the glib library is not bundled with mergecap even when a static build configuration is requested, so the method g_malloc_n (part of GLib) will fail to load when GLib is not installed on the machine. This is explained by the small size of mergecap (570KB), which should have been larger if GLib and other libraries were linked statically. Same goes for other utlities except dftest and rawshark, their small size suggests that the required libraries were probably not linked with the executables. This method results in a larger binary of 1565KB that works well on just a CentOS base installation. I guess the same method can be applied to other executables (editcap, dumpcap, etc.) 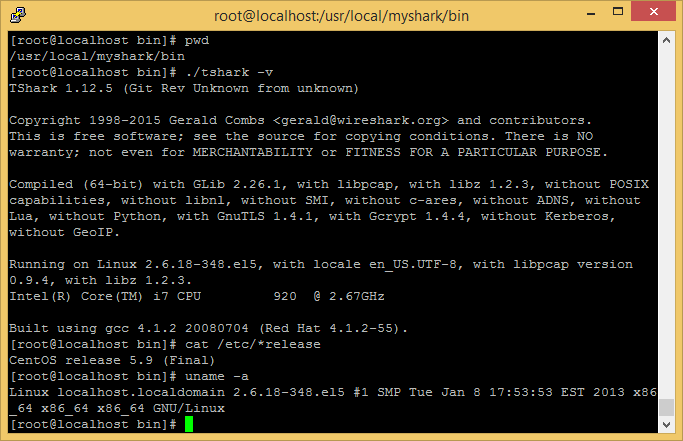 should there be a need to run them standalone on CentOS 5. Unfortunately, you cannot build the RPM for Wireshark on CentOS 5.9 using this method. Commands make dist and make rpm-package will fail with uic not found message. This is because somehow the RPM build of Wireshark will still use uic even when we are not interested in the GUI version of Wireshark, only tshark. On a side note, the last version of Wireshark that can be compiled natively on CentOS 5 without resorting to static builds of GLib is version 1.5.0, released in April 2011. The Wireshark 1.12.5 static build for Cent OS 5 can be downloaded here. The static build of mergecap can be found here. I guess the next challenge would probably be manually compiling newer versions of GCC for CentOS 5 and using that version of GCC to compile Wireshark. This will be needed once the Wireshark team decides to stop supporting GCC 4.1.2, which is the latest available version on CentOS 5.